By its original design, FTP (File Transfer Protocol) is not secure, meaning it doesn’t encrypt data being transmitted between two machines, along with user’s credentials. This poses a massive threat to data as well as server security. In this tutorial, we will explain how to manually enable data encryption services in a FTP server in CentOS/RHEL 7 and Fedora; we will go through various steps of securing VSFTPD (Very Secure FTP Daemon) services using SSL/TLS certificates. Before we start, note that all the commands in this tutorial will be run as root, otherwise, use the sudo command to gain root privileges if you are not controlling the server using the root account. 2. Then run the command below to create the certificate and key for vsftpd in a single file, here is the explanation of each flag used. req – is a command for X.509 Certificate Signing Request (CSR) management. x509 – means X.509 certificate data management. days – defines number of days certificate is valid for. newkey – specifies certificate key processor. rsa:2048 – RSA key processor, will generate a 2048 bit private key. 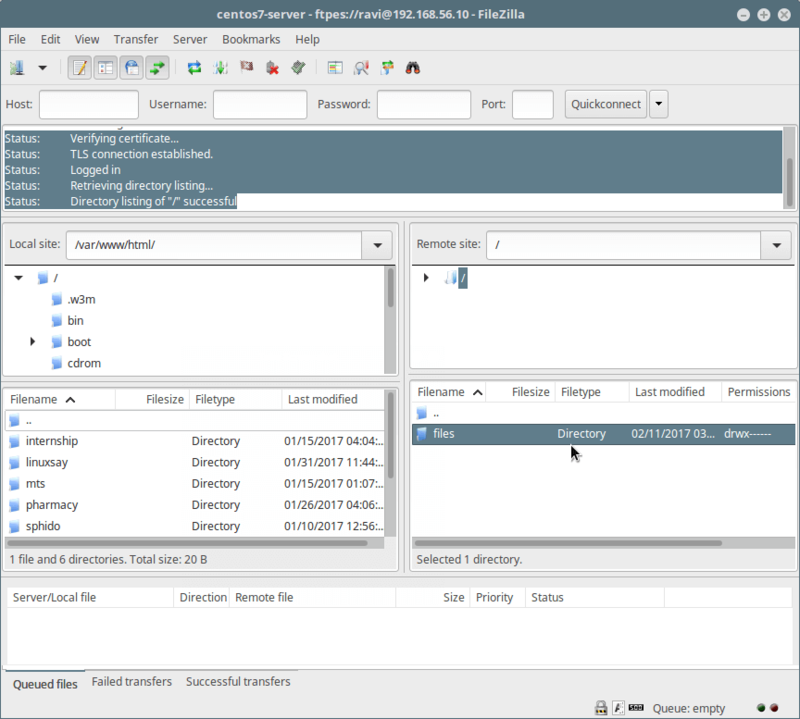 keyout – sets the key storage file. out – sets the certificate storage file, note that both certificate and key are stored in the same file: /etc/ssl/private/vsftpd.pem. The above command will ask you to answer the questions below, remember to use values that apply to your scenario. 7. In addition, we can add the options below to boost up FTP server security. When option require_ssl_reuse is set to YES, then, all SSL data connections are required to exhibit SSL session reuse; proving that they know the same master secret as the control channel. Therefore, we have to turn it off. 8. Now, set the port range (min and max port) of passive ports. 220 Welcome to TecMint.com FTP service. 530 Non-anonymous sessions must use encryption. From the screen shot above, we can see that there is an error informing us that VSFTPD can only allow user to login from clients that support encryption services. The command line does not offer encryption services thus producing the error. So, to securely connect to the server, we need a FTP client that supports SSL/TLS connections such as FileZilla. 11. 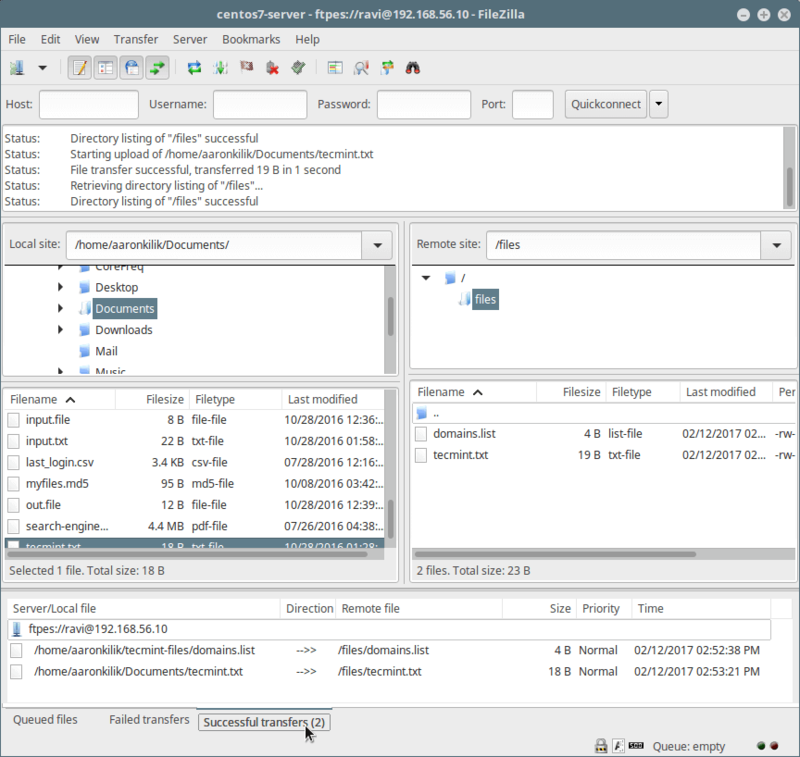 FileZilla is a modern, popular and importantly cross-platform FTP client that supports SSL/TLS connections by default. 12. When the installation completes (or else if you already have it installed), open it and go to File=>Sites Manager or (press Ctrl+S) to get the Site Manager interface below. Click on New Site button to add a new site/host connection details. At this stage, we should have logged successfully into the FTP server over a TLS connection, check the connection status section for more information from the interface below. 15. Last but not least, try transferring files from the local machine to the FTP sever in the files folder, take a look at the lower end of the FileZilla interface to view reports concerning file transfers. That’s all! Always keep in mind that FTP is not secure by default, unless we configure it to use SSL/TLS connections as we showed you in this tutorial. Do share your thoughts about this tutorial/topic via the feedback form below. 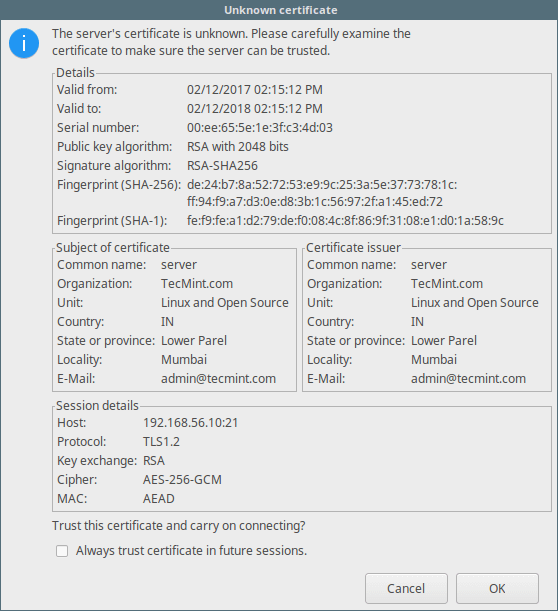 One question, how to regenerate the certificate once it expired? Just follow the same steps in the article. We have to do a little research on this, i mean connecting securely over a browser to your vsftp server. But for the mean time, consider using the solution we have provided, that way, all your connections will be secure. Once we find a way, we will keep you posted. Thanks for the feedback. I did all steps but unfortunately Filezilla says it can’t retrieve directory listing when connecting to the FTP server. Do you have any idea what could be wrong? I’m installing on Fedora 25 Server. Hope you enjoyed it! Try to enable proper permissions for the connected user’s ftp directory. Follow How to Install, Configure and Secure FTP Server in CentOS 7 – [Comprehensive Guide] to do this. Thanks for appreciating out work. In case it doesn’t work, get back to us. Server asks for authentication with a client certificate. Additionally, if you set the debug option, check out the vsftpd log file for more info. I am getting the same error and am not sure what to do here, can you help me! You can use lftp to securely connect SFTP through linux CUI. Okay, many thanks for sharing this with us, we’ll definitely give it a try.